Submitted by a_warming_trend on March 3, 2015 – 5:57pm. For whatever reason, these last few weeks have forced me to challenge my preconceptions about sourdough baking. My previous challenge: Could I bake nice loaves from dough retarded in the back of a Ford Fiesta during an ice storm? And then there I was, with every intention of baking my first sourdough hearth loaf with a lot of seeds and multiple grains. I crafted such a promising recipe: 20% whole wheat levain, 85% hydration, 20% whole wheat, 20% whole rye, 7% pumpkin seeds, 7% sunflower seeds, 3% flax seeds, 3% sesame seeds, 5% honey, 2.2% salt. 7-hour autolyse of flour and water. I mixed and slap/folded for 5 minutes. I performed my standard stretch-and-folds at 30-minute intervals for 2 hours. I let the dough rest for 3 hours. It rose what I judged to be 40 to 50% — just the right amount for shaping for a long, cold proof in the refrigerator. So I thought. When I went to check the dough after 8 hours in the fridge it had not risen visibly at all. I knew I wanted to bake it that morning, but I knew I couldn’t in good conscience bake such an obviously under-proofed loaf. So, I decided to leave it at room temperature while I was at work. I was fairly sure I could be home early — within 6 hours. As it turned out, I wasn’t able to walk through the door until 11 hours later. The dough was brimming over the banneton in the most disheartening way. It was terribly over-proofed. But I wanted to rescue it! I had to rescue it! Shaping it into a hearth loaf was out of the question. It was just too goopy and unwieldy. So, I got out my loaf pan for the first time in years, and I sort of shaped/poured the dough into it. I let it sit for 1.5 hours. The weird, unorthodox “third rise.” Third rise! It rose beautifully, so I baked it at 475, with foil over the top for the first 20 minutes, and no foil for 25 minutes. The result was a delicious loaf of bread from a bread pan. A bread pan! I think that I need to open my mind to the notion of the bread pan. 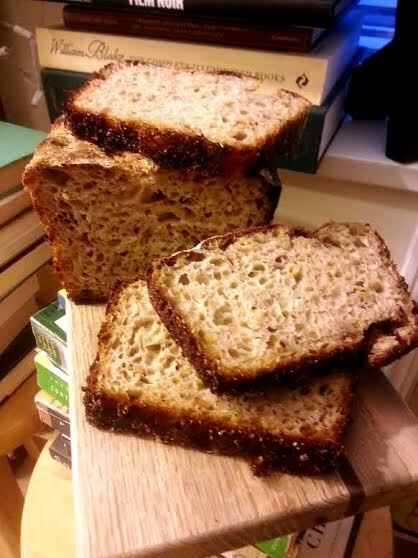 Because this triple-risen accidental bread tasted very good — nutty, tangy, slightly sweet. so custardy that it begs to be toasted. 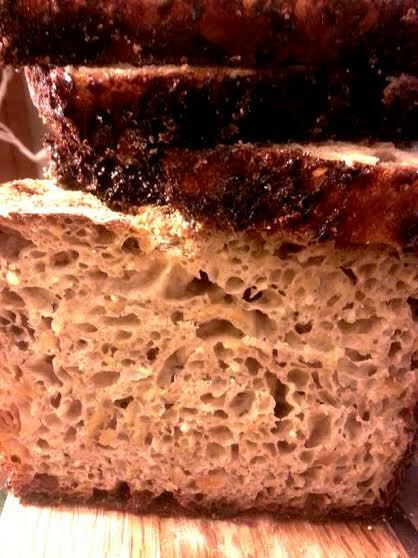 Yet again, the lesson is: Never give up on your sourdough. Find a way to bake the bread. Even if it’s gotta rise three times. At least a significant percentage of the time, you will be rewarded!